Move over, Yukon Golds! There’s a new potato in town. 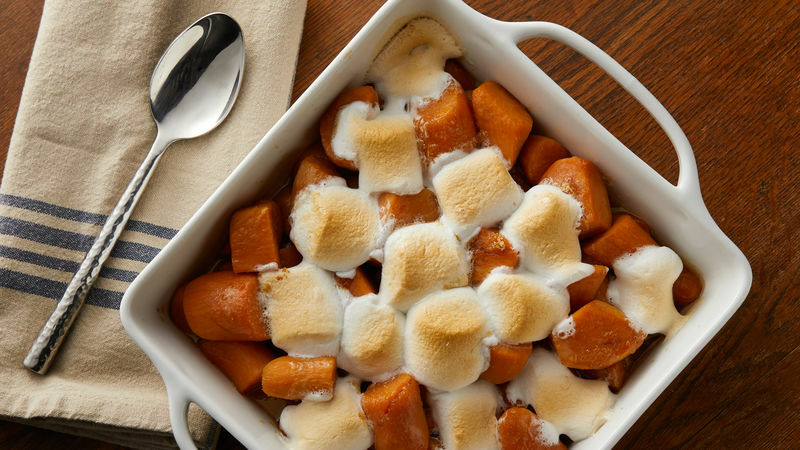 If you haven’t been eating sweet potatoes, now is the time, and we have more than 20 recipes to get you started from classic sweet potato casserole (with marshmallows, of course) to cozy sweet potato soups and everything in between. Sweet potatoes date back thousands of years to Central and South America. Fast forward to present day, and sweet potatoes are very popular in the United States, and are often associated with Thanksgiving, with a peak harvest season from late October through December. While it’s no secret that the orange-fleshed potatoes are a good source of beta carotene (which helps with vision and a healthy immune system), sweet potatoes provide a long list of nutrients, including vitamin A, vitamin C, manganese, calcium, potassium, iron, vitamin B6 and fiber. A food that’s both delicious and pretty good for you too is a win in our book, and now you can eat it for every meal (even dessert!). When storing your sweet potatoes, it’s important to avoid storing them in the refrigerator. This will give the sweet potatoes a hard center and unpleasant taste. To avoid this, store your sweet potatoes in a cool, dry, well-ventilated container. For best results, sweet potatoes can be stored up to two weeks before eating. Depending on your preference, you can peel your sweet potatoes or choose to leave the skin on for added texture. To peel sweet potatoes, you’ll need a cutting board, a sharp chef’s knife and a serrated peeler. Note: Any sharp vegetable peeler will do the job, but a serrated peeler will be more efficient because it will grip the sweet potato’s skin. First, you should rinse and dry your potatoes to make sure they are clean before any cutting takes place. Once that is complete, peel the sweet potato from root to tip, making long, even strokes to remove the peel. Sweet potatoes are commonly cut in three different ways: slices, sticks (also called batons) or cubes. Once you’re ready to begin, brush up your skills with our How to Cook Sweet Potatoes article and you’ll be a potato pro in no time! Most people associate sweet potatoes with Thanksgiving, but don’t limit your sweet potato consumption to just November. In fact, National Sweet Potato month is in February, so you can eat this tasty tuber all winter long. From sweet potato soup to sweet potato pie cookies, there’s a sweet potato recipe for every meal of the day.